Golf carts are not different from ordinary cars when it comes to using and maintaining batteries. What many people do with their car batteries can also be applied with golf cart batteries. However, there are still many people who have a lot of questions about using batteries. In fact, some of these questions are basic, but sometimes it may seem hard to find the right answer. Therefore, we will help you get the right answers without sounding to technical as it’s important to know and understand everything, especially when it comes to your safety. 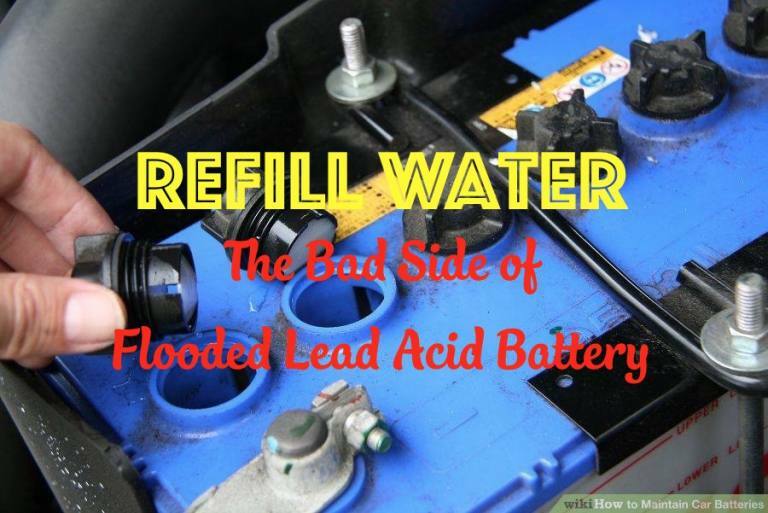 Why Is It Necessary to Refill Water on Golf Cart Battery? It’s important for you to be aware that your golf cart battery contains sulfuric acid and electrolytes. These components submerge the plates in order to produce energy. When the battery is discharged, the water level that contains electrolytes becomes lower. This is normal as the water gets back to its normal level after recharging. The critical condition is when the water level becomes lower even if the battery is not discharged. This happens during the summer or in places with higher temperatures. When a golf cart is exposed to high temperatures for a prolonged period of time, the water inside the battery tends to evaporate. As the water continues to evaporate, the water level becomes lower and lower. This makes the plates to get exposed in the air much longer, and because of this, the plates start to dry out and flake off. This condition is called sulfation, and when this happens, you can no longer recharge the battery. To avoid this, you should refill the water in your golf cart battery regularly. What Is the Right Way to Fill a Golf Cart Battery? Just because you need to regularly fill your golf cart battery doesn’t necessarily mean you should keep on filling it every time you see the water level is low. It’s important you know how to fill a battery properly. Do not refill a discharged battery. Although the water level is low, it will go back to its full state after recharging. When the battery is already in its full state, that’s the time you should determine whether the water level is low or not. Only refill a battery in its full state. This is because refilling it in its discharged state can cause the battery fluid to leak after recharging. On the other hand, not all types of water can be used to refill a battery as only distilled water should be used. This type of water doesn’t contain any chemicals or minerals that may interfere with the normal chemical process inside the battery. Most importantly, don’t overfill your battery with water. Just give your battery some breathing room because an overfilled battery may cause water to overflow. This can lead to corrosion; moreover, acid leaks may harm you in the process. How Often Should I Refill a Golf Cart Battery? Refilling your golf cart battery with water depends on the condition that may affect it. Basically, the more you use your golf cart, the more you should refill the battery. On the other hand, you should also regularly check the water level in your battery even if your golf cart has not been used for a long time to avoid sulfation. How to Know Which Level Is Right? The idea behind refilling your battery with water is to prevent the plates from getting exposed. When you refill, make sure the water level is above the plates. You might also be wondering what level is right so you don’t overfill it. In your battery, you can use the plastic vent as your gauge. Make sure the level is slightly below the bottom of the vent. Do I Need to Refill Acid or Electrolyte? The acid and electrolyte components of a battery are stable. This means they don’t get depleted unless the battery leaks. However, in the normal process, all you have to do is to refill the water. Even if the water evaporates, the required amount of acid and electrolyte remains the same. Why Would One Trojan 6 Volt Golf Cart Battery Go Bad? Every battery can go bad, and it doesn’t matter whether it’s a Trojan 6 volt, 12 volt, or any other brand. The truth is that there is still no such thing as a perfect battery. The most common problem with the Trojan 6 volt is gassing, which is caused by an imbalance spread of the amount of electrolytes and acid. Nevertheless, this can be avoided through keeping the water at normal levels. Golf cart batteries may seem to be complicated to use, but it’s easy to maintain once you know the proper way of using it as all batteries need to be taken care of. Even the most sophisticated battery may also give you a headache down the road. What’s important is you are aware of what’s going on with your battery. Should you have any further questions, feel free to leave a comment here, and we can include it in our list of the most frequently asked questions. I have new golf cart batteries and every time I check for water they don’t need anywater. My spinner doesn’t move. Could my hoses be clogged.My batteries are new and I don’t use the cart gut twice a week. Help!! Battery H2O level went way low and cart not able to receive charge??? Can anything be done after refilling all batteries to get charge back. Any type of additive??? Did fill w Distilled H2O.